At the time when the campaign first launched, the final stretch goal was at $1.5 million and it promised “The Hall of Echoes” which will include the functionality required for a player home. 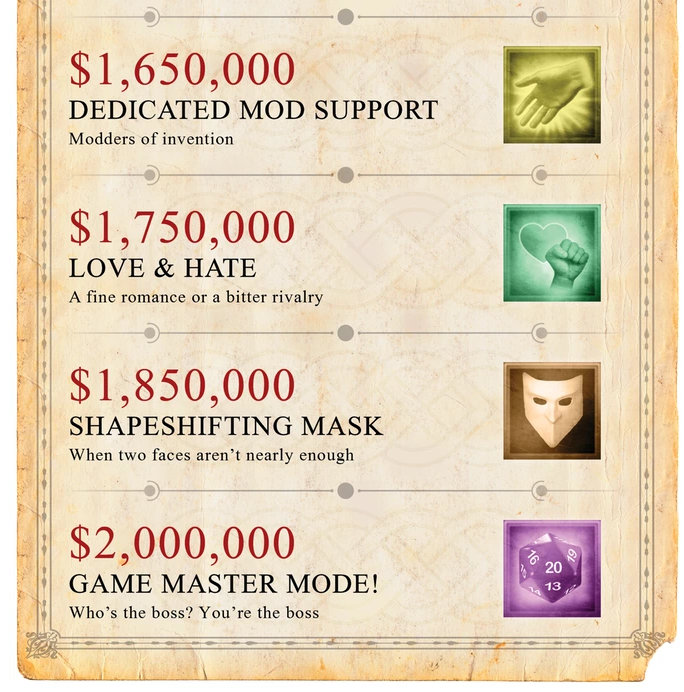 Now, however, the final stretch goal is at $2 million at it promises a harder difficulty. Included in between are stretch goals for mod support, romancing, and a game master mode. While I have written about my concerns with projects that extend their stretch goals upon seeing popularity and success with their Kickstarter campaigns on a different post, I hope that the people at Larian Studios know what their team is capable of and aren’t promising more than they can deliver; they did successfully create the first Divinty: Original Sin and it was Kickstarter funded as well. The Kickstarter page for Divinity: Original Sin 2 is here. If you are interested in supporting this Kickstarter campaign, the best one to grab right now would most likely be the $26 tier that includes a Steam / GOG copy of the game. There are just 185 spots left for that tier though, so hurry! Edit: The description of the final tier has been edited for correctness. Ah yes, the issues featurecreep poses. Fortunately the additional features seem somewhat simple to implement, though I think you might’ve caught the wrong meaning on the final stretch goal – in RPGs “Game Master” usually refers to who runs the whole show, so I’d imagine a “Game Master mode” is the one where a player gets to create quests and guide other players in their own stories, with their own locations and challenges. That’s further corroborated by the “Who’s the boss? You’re the boss” descriptor but still is vague at the very best. voxludicus, that makes perfect sense! Actually I was confused about what the final tier was about and I was thinking about putting (?) after character customization. Thank you for letting me know! Post edit incoming.